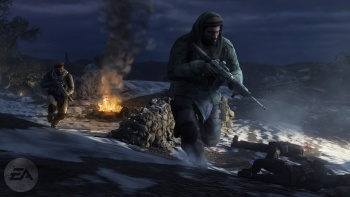 British defense secretary Liam Fox has urged retailers not to stock the upcoming Medal of Honor game, saying that he is disgusted that the game allows players to be the Taliban. Anger at EA's Medal of Honor allowing players to assume the role of Taliban soldiers in the game's multiplayer has reached the upper echelons of the British government today, as Fox expressed his disgust for the game, and called upon British retailers to ban it from their shelves. Fox said that he found it hard to believe that anyone in the country would want to buy such an "un-British" game, and that he was shocked that anyone would think that a game where you could be the Taliban was acceptable. "At the hands of the Taliban, children have lost fathers and wives have lost husbands," he said. "I would urge retailers to show their support for our armed forces and ban this tasteless product." A spokesperson for EA said there that Medal of Honor was just a game, and merely reflected the fact that conflicts has two sides. She likened it to a game of cops and robbers, saying that somebody had to be the bad guy. As I understand it, it would be illegal for the UK government to try to ban Medal of Honor itself, which is presumably why Fox is trying to guilt trip retailers into banning it for him. It's not hard to see why Fox is upset - EA knew this would be controversial when it was making the game - but it's still a little sad to see an elected official respond in such a knee-jerk manner.